I “blove” cats and miss having one of my own. I’ve been feeding special tidbits to the cat next door for more than two years now. It took weeks to get her to come to me and more weeks before I could touch her head. Now she rubs me all over and bites when I’m ready to stop before she is. Of late, she’s been telling me her bowl is empty and I thought her people were being quite negligent. Then I discovered the true reason–a couple of frisky kittens. 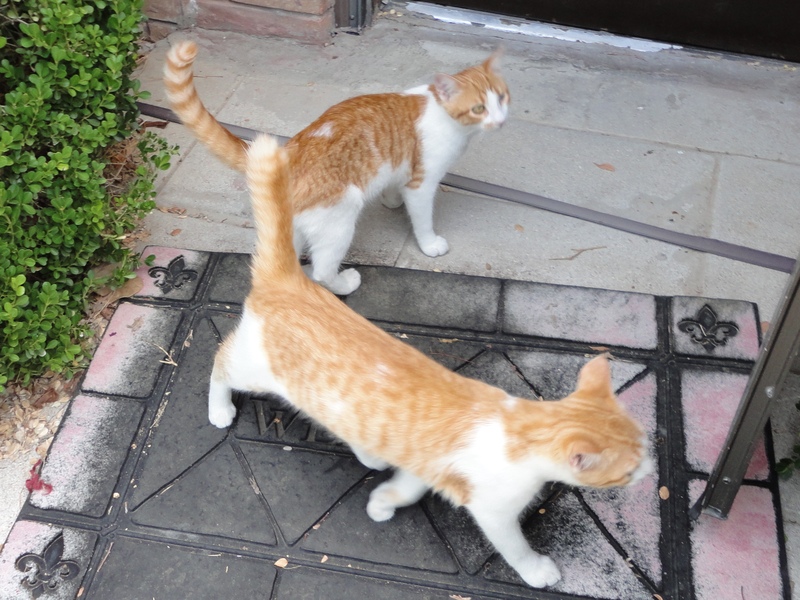 The cat food thieves look to be around three months old, siblings of yellow and white, and homeless. They came boldly into my yard, begging shamelessly when they heard me call “Kitty, Kitty” to the neighbor’s elegantly marked tuxedo cat. That they are brothers is undeniable, as they must have been close to identical until one lost his eye and the other lost a couple of inches off his tail. One-Eye and Stubby is how I think of them. Stubby is overtly friendly, insisting on a head rub with his food. One-Eye is a bit skittish, not having his peripheral vision intact. I thought briefly about adopting one of them or suggesting to my husband that the little stub tail is rather cute. They’re both adorable when they play…but who wants a half-blind cat? Visiting on an elderly neighbor’s porch, I found out she’s been feeding them her expensive dog kibble. “I won’t let them starve,” she assured me, wagging her head about the irresponsibility of people who have allowed or caused this situation. She doesn’t much like cats. I am slowly losing the vision in one eye, and unless the ophthalmologist can figure it out pretty soon, I could eventually be just like the blind cat, bereft of my peripheral abilities and growing skittish, unsure of my footing and jumping at shadows. When I walked into the yard yesterday, all three cats were meowing for food. One-Eye kitty was the one who hung around after eating, lazing under the carport while my husband worked out there. He does rather grow on you. Who wants a half-blind cat? Maybe a half-blind author. This entry was posted in Short Takes on Life and tagged adopt a cat, blind, cats, homeless, kittens, ophthalmologist, peripheral vision, siblings. Bookmark the permalink. Who wants any of us? It’s hard. I’m in the middle of a depressive episode. Not feeling too loveable. A kitten that’s threatening to expire is laying on my arm & chest. Could we all just get better? Please God. Heal Janet. We. Need her. Thank you. Oh, Pat, I’m so sorry for the pain! Thanks for the prayers. May you have comfort and peace as you try to give the same to one of God’s little creatures. My sister is more than happy to continue to love her half-blind dog. I already decided next time I adopt another shelter dog, I’ll look for one just like me—rejected, unloved, beaten by life, and one of the ‘hard cases’ no one else wants. We should understand each other just fine. JJ, just make sure you get to know your choice a little before making a decision. Some of those “beaten by life” can be real snarly, perhaps not appreciating what you’re trying to do for them. But, yes, it feels good to help the less fortunate animals. Thanks for commenting. Well, I’m batting 1000 so far doing just that. They know; they appreciate. It just takes patience, an ‘animal magnetism’ and love for animals I inherited from my dad, and perhaps prayers to St. Francis of Assisi, but even the most stubborn have eventually warmed up to me; one feral dog took almost a year before she would let me touch her, and I was the only human she would allow anywhere near her. My current adoptee of twelve years has been the best, most loyal, most affectionate friend I’ve ever had, of any species including homo sapiens sapiens. She, and I, are the only ‘survivors’ of a once large and happy pack. She was hauled out in the country in rural Oklahoma twice and dumped (as was I), but was resourceful enough to survive (as was I). So you see, we understand each other… quite well. Sorry for the triple-post; I”m absent-minded today. The above about patience with snarly abused animals was meant to include this: Barbara Woodhouse, one of the very first TV ‘dog whisperers,’ rescued many ‘impossible’ behaviour problem dogs scheduled for destruction. Her catch-phrase, and title of her book was “No Bad Dogs (Only Bad Owners).” I agree.